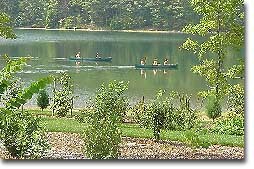 A popular state park 7 miles east of Cumberland of Interstate 68, 40 offers mountain scenery, hiking trails, campsites, boat launching, and a swimming beach on a 243-acre lake. The 2,900-acre park is located in a natural saddle between Evitts Mountain and Martin Mountain. A large conference center, hotel, and championship 18-hole golf course were added to the park in 1999. Rocky Gap is known for a large music festival held each summer. The festival includes nationally known country and western stars who perform in a large outdoor arena.